Where should content marketing leaders go to refuel and refresh their content marketing program? Having conducted hundreds of customer interviews over the years on behalf of my clients, I find the raw, unfiltered perspectives of customers provide powerful, new insights. I’m not talking about gathering quotes for a customer testimonial; I’m suggesting creating a steady stream of conversations that can inspire your content marketing program. There are many ways to gather customer input to feed a content marketing program. Because we want to be efficient with our time, many of us often turn to technology, such as the online form builders, online surveys, and omnibus studies, to gather input. But, when we use technology to gather customer input, we often miss three critical ingredients: depth, context, and emotion. Effective content marketing is about mining and sharing stories that matter most to your brand’s core fans. It’s about sharing the emotions and the drive behind those stories – that’s what people love to read, listen to, or to watch. Simply put, it’s about being more human rather than relying on mechanisms that gather lots of data but offer little in terms of emotion. This hit home for me over the past year while working on the content marketing program for a major U.S. trucking firm, Transport America, which wanted to attract and retain more qualified drivers, and uses www.changingtrucking.com as its online home. When you’re putting out a monthly newsletter with four stories, along with a social media campaign featuring daily Facebook posts, you’re going to run out of gas if you rely on re-merchandising existing marketing content. Instead, we went to the source: the 1,700 truck drivers who drive those 18-wheelers across the continent. Sure, it’s easy to ask in an online survey or a Facebook post, “What are your favorite trucking songs?” or “Is the greatest trucking film of all time Smokey and the Bandit?” But to uncover deeper insights, we needed phone and face-to-face interviews with real drivers who haul loads of packages, parts, and products all over the United States and Canada. We regularly interview more than a dozen drivers a month, with each conversation lasting an hour or more. When you take that much time to talk to people, you become a witness to their stories and gather real-life, substantive details that make content come alive. For a recent story, we talked to three women truck drivers about how they got into trucking, the unique challenges women drivers face, and what keeps them going. In our interviews, we listened to how many of these women were seeking a better life, how they were surprised that they were as good at driving as male drivers, the confidence they gained as drivers, and how the trucking company they worked for (our client) supported them. We learned from one female driver, a single mother with three kids from Chicago, how she made the leap from working as a manicurist to realizing her dream as a truck driver. (Her father was a truck driver and many people in her life had told her she couldn’t cut it as a driver.) From another, we learned that she and many other women don’t want special treatment from their male counterparts; they simply want to be respected as drivers. These kinds of stories, posted on the trucking company’s blog and distributed through its monthly newsletter, demonstrate why this particular trucking company is a great employer for women drivers. Our company has taken this same approach with HVAC and refrigeration technicians, fishing boat owners, and outdoor adventurers, among many other consumer groups. You will not gain the same level of insights from an employee-engagement survey or a focus group. The bottom line: The brand experience begins the moment a potential customer searches online for information to fulfill a need or solve a problem. By the time the prospect is ready to pick up the phone, email a representative of your organization, or walk through the door of a retailer, that individual already has gone through 80% of the sales funnel. Those companies still on the list are the organizations that provided the greatest value with content. In my experience, the surest way to deliver valuable content is to go back to the very customers who got you there, understand why they remain loyal to your brand and how they’re using your company’s product or service, and then share their experience with those entering the buying process. If you want more authentic, relevant content, you need to do one thing: Ask. Pick up the phone. In this high-tech world, we rely too often on texts, social media posts, and email. Marketing is about creating two-way conversations with customers. If you want to fuel your content marketing program, the most efficient way to do that is to pick up the phone and have a conversation with a customer, business leader, or influencer. 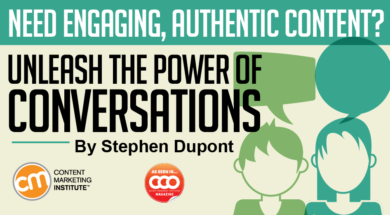 One-to-one conversations help you uncover context to create more powerful content. Listen in. Many organizations have customer service departments or call centers where consumers can order products or call about warranty issues. These calls uncover how customers feel about your product/service and how your organization treats its customers. Take an hour or two to listen in and make sure others on your team take turns doing the same. Consider including outside resources such as agencies and freelance writers. Form an advisory panel. Newspapers and magazines create advisory panels to source new ideas and brainstorm with a publication’s editorial staff. Use this concept to generate story ideas for your company’s content platform. Working with other departments (e.g., sales, engineering, HR, customer service), form small groups representing niche. Host face-to-face meetings at least once a year with these groups to gather ideas for owned, earned, and paid media programs. Go where the super fans gather. Motorcyclists go to Sturgis in August. Electronics and computer fans head to the Consumer Electronics Show in January. Birding enthusiasts go to Joppa Flats every January. Truck drivers drop by Walcott Truckers Jamboree in July. Nearly every interest or industry offers a time and place where its most die-hard enthusiasts enjoy gathering and sharing stories. You should be there too to understand what makes super fans tick. Get out from behind your desk. Don’t be afraid to leave your desk and visit with a customer on his or her turf. See the impact of your organization’s products or service in person. If you represent a trucking company, go visit a truck stop. If you work for an industrial equipment manufacturer, take a tour of a plant. If you represent a fishing lure company, call up a local fishing club and ask if you can come to a meeting. Invite customers to co-create with you. For a well-known binocular manufacturer, we provide samples of the company’s product to climbing, hiking, and back-country guides in exchange for photos demonstrating how to use the product in the field (actually, on the side of mountains). This program not only fuels our client’s social media channels, it lends its content authenticity and saves significant content-creation time. Seek out the “rejectors.” If you want to take your efforts farther, consider interviewing those who chose a competitor’s product or service. You will likely learn something new from those who learned about your product/service but chose a different path. Nurture your credibility. Many organizations publish white papers or conduct webinars with the intent of establishing their employees as experts in a particular industry or subject matter. Go a step further. Nurture relationships with outside experts and quote them in the same white paper (or other piece of content). For a client that develops information security software systems, we made it a practice to interview and quote up to three outside experts in its white papers — whether from customers, related nonprofits, or government agencies. Doing so elevates everyone’s credibility, including your internal subject-matter experts. 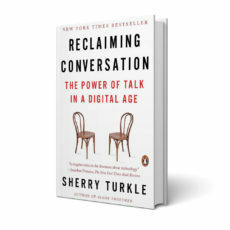 In her most recent book (Reclaiming Conversation), psychologist and MIT professor Sherry Turkle argues that we’re communicating more than ever, but at the expense of deeper, more meaningful conversations. She makes the case for unscripted, open-ended human exchanges — and how the lost art of conversation makes us more collaborative, empathetic, and insightful at home and work. This article originally appeared in the December issue of CCO magazine. Subscribe for your free print copy today. Stephen Dupont is the vice president of public relations and branded content for Pocket Hercules. Follow him on Twitter @stephendupont.